In this section we will cover die attach materials. There are several major classes of materials, including liquid-dispensed materials and adhesive films. Stay tuned as we cover this topic in the following slides. We will cover the two major types of die attach: epoxy die attach, and eutectic die attach. 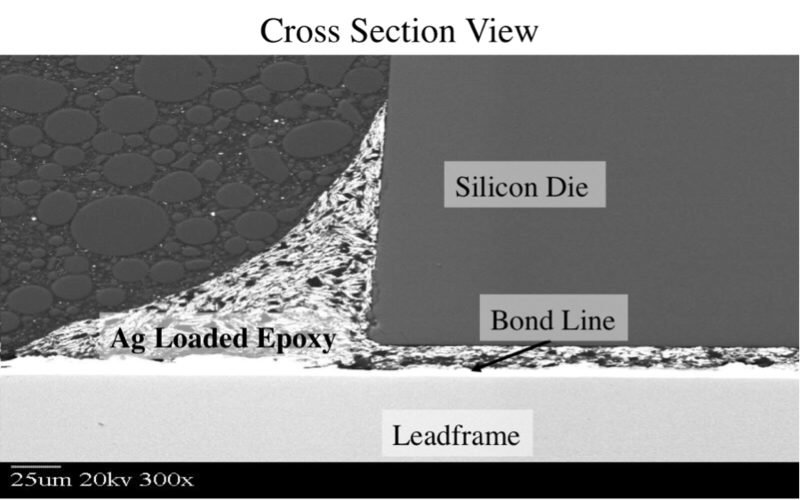 An epoxy die attach consists of a polymer thermoset loaded with a conductive material, like silver. A eutectic die attach consists of two conductive metals alloyed together in the correct ratio to produce a eutectic material. There are some other additional properties that can be important for certain applications. For instance, a one-component epoxy system can be stable at room temperature for applications where frozen storage and shipment cannot occur. However, these epoxies require higher curing temperatures. A quick curing epoxy might be necessary for high volume manufacturing. Low outgassing is necessary when engineers use epoxy die attach materials in hermetically sealed components as the outgassing can lead to moisture or hydrocarbon buildup. Low curing temperatures can help reduce stress in certain packaging systems. Engineers use UV curable epoxies for some optoelectronics applications where thermally-induced outgas byproducts can degrade optical performance. 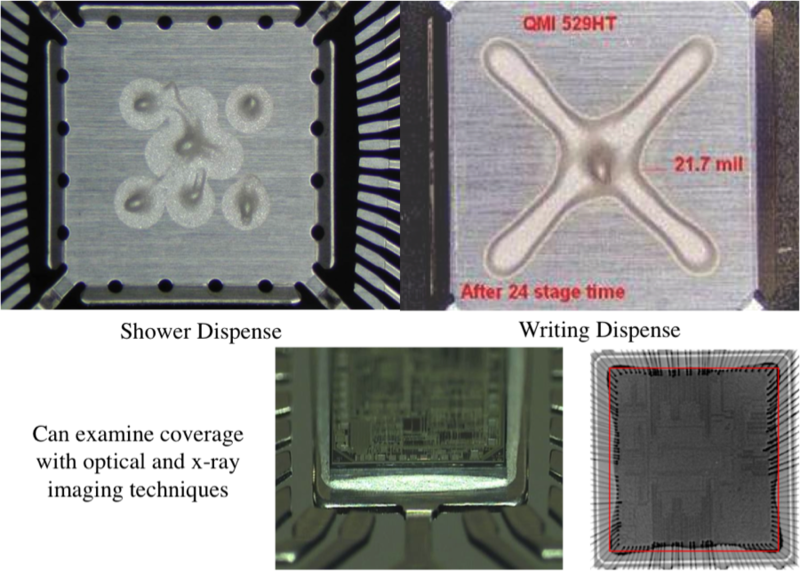 And low ionic impurities can reduce issues with ionic contamination in sensitive transistors. The manufacturers ship fast cure die attach frozen in a syringe. The assembly engineers then let it thaw and use it. These materials have a floor life of 24 hours so they need to be used relatively quickly. There are also shelf stable epoxies that do not require refrigeration. These don’t require mixing either, but they do need higher temperatures to cure. 250 to 300 degrees centigrade is common, so this may not be feasible for high volume manufacturing. The image above shows the general use of epoxies in high volume manufacturing. 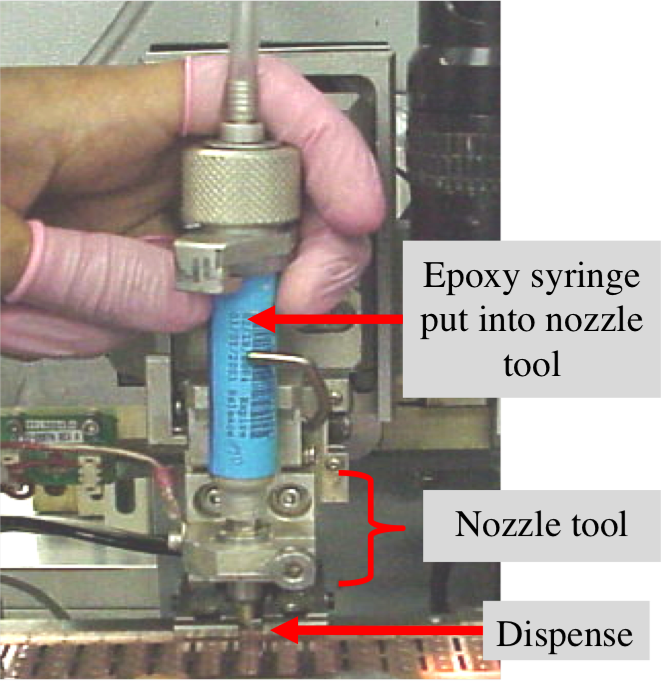 An operator inserts the epoxy syringe into the nozzle mechanism in the die attach machine. The system then uses pressure to dispense the epoxy onto the leadframe. There are two methods for die attach dispense: the shower dispense and the writing dispense. For large dice, the writing pattern works better, but it takes longer to do in assembly. Most companies will use shower dispense on small dice, and a writing dispense on a larger die. The machinery can write various patterns onto the leadframe, similar to the way a dot matrix works. Fillet height is important, so the engineers program the machinery to control the fillet height to between 25 and 75% of the die height on the side of the die. After die attach dispense, one can use optical or x-ray imaging techniques to examine the coverage and the fillet. The image above shows a cross-sectional view of a proper die attach fillet. In a plastic package, the die is bonded to the die paddle, or the leadframe, using a silver-filled or silver-loaded epoxy. The silver flakes are the bright regions within the die attach. The die attach not only provides a mechanical connection between the die and the leadframe, but also provides an electrical connection. Problems can arise if there is insufficient silver in the epoxy, or if the silver becomes stratified. This can increase the resistance between the die and the leadframe. The silver-filled epoxy should also “wet” or make good contact to both the die and the leadframe. A good wetted epoxy contact will form a long smooth contact to the surface while a poor contact might ball up and have limited contact to the surface. This can occur as a result of poor cleaning processes, contamination, or low temperatures. The next technique is the T-Test. The T-Test assesses whether the means of two groups are statistically different from each other. We use this analysis to compare the means of two groups. Explained in layman's terms, the T-Test determines a probability that two populations are the same with respect to the variable tested. For example, suppose we collected data on the heights of male basketball and football players, and compared the sample means using the T-Test. A probability of 0.4 would mean that there is a 40% likelihood that we cannot distinguish a group of basketball players from a group of football players by height alone. That's about as far as the T-Test—or any statistical test, for that matter—will work. If we calculate a probability of 0.05 or less, then we can reject the null hypothesis (that is, we can conclude that the two groups of athletes can be distinguished by height). We can perform the T-Test knowing just the means, standard deviation, and the number of data points. Note that the raw data must be used for the T-Test—or any statistical test, for that matter. If we record only the means, we lose a great deal of information and this usually renders our work invalid. The two sample T-Test yields a statistic t, in which the signal to noise ratio is given by the difference between the two group means divided by the variability of the two groups. We show some of the associated mathematics here as well. The following Excel sheet shows an example of a T-Test calculation on propagation delay data. One calculates the means, standard deviations, and determines the number of samples in each group. One can then use the equations we discussed, or, one can use the Microsoft Excel formulas T.TEST and T.INV.2T to calculate the T-statistic and the confidence. The higher the T-statistic, the greater the likelihood that the two samples have come from the same two underlying populations that have the same mean. The T.INV.2T value gives us the probability that associated with the T-distribution. The equations actually generate the same value as the T.INV.2T function. In this example, the value for T.INV.2T is quite low, indicating that there is an extremely low probability that these samples come from different distributions. Another way to put it – these two samples likely come from the same distribution, or the machines used to produce this data are almost identical. 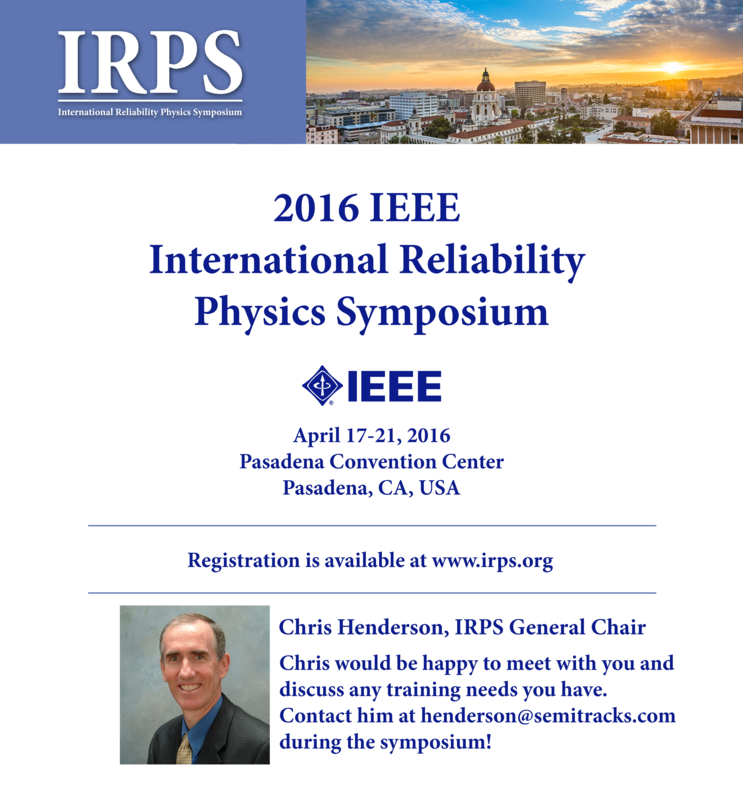 Q: How can I make backside temperature measurements during RTP at multiple locations? A: There are two main methods for making temperature measurements during RTP: optical pyrometry and thermocouples. To make measurements at multiple locations, one would need multiple optical pyrometers, or multiple thermocouples. Another possibility with optical pyrometers is to mount the pyrometer such that it can be moved to focus on different areas, or use an infrared camera system to make a map. The challenge with optical pyrometry is that one must compensate for emissivity due to backside metallization schemes. Mounting of the optical pyrometer may also be problematical, as many detectors cannot be directly exposed to high temperatures.